The world of marine animals is a very diverse, fascinating group and includes animals from relatively motionless invertebrates to large whales & sharks who range across the oceans. Our planet’s oceans cover approximately 70% of the earth’s surface with an average depth of 2.4 miles or 3,800 meters. The marine ecosystem in addition to the temperate and tropical oceans, includes the shorelines with mud flats, rocky and sandy shores, tide pools, barrier islands, estuaries, salt marshes and mangrove forests making up the shoreline segment. 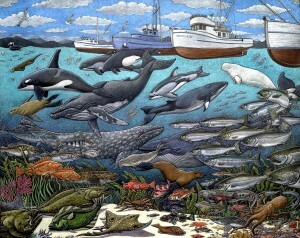 Marine ecosystems support a great diversity of life and variety of habitats. The oceans are a major influence on weather & climate. Conventionally, our planet’s ocean regions have been divided into 5 major ocean basins, the Atlantic, Pacific, Indian, Arctic and Southern. Specific marine ecosystems such as coral reefs, estuaries, salt mashes, mangrove forests are found throughout the world, but are characteristic of certain areas depending on climate, geography, water temperature and other physical factors. Cetaceans are mammals who are adapted to life in the water. 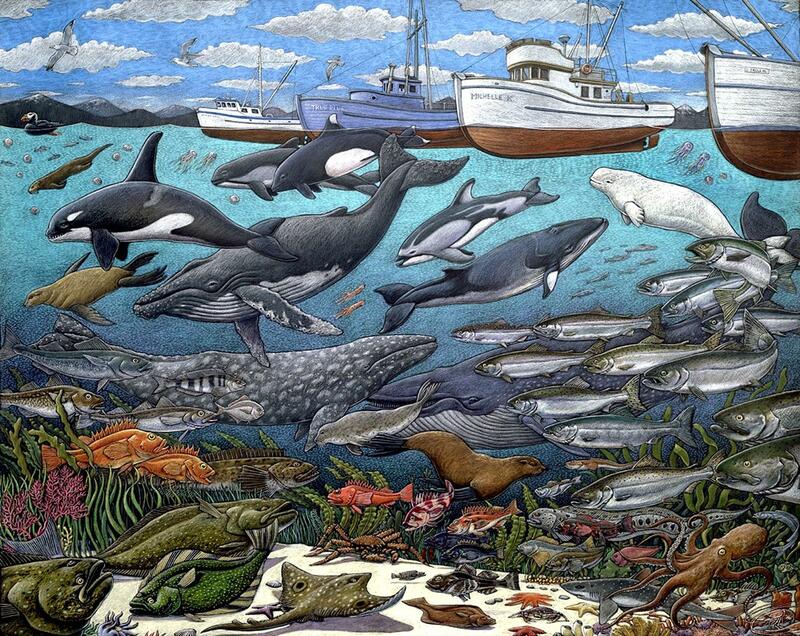 There are over 80 species of whales, dolphins and porpoises from the small Hector’s Dolphin to the huge Blue Whale. Pinnipeds are mammals in the order Carnivora and suborder Pinnipedia. There are 3 families of pinnipeds: the Phocidae, the earless or ‘true’ Seals; the Otariidae, the eared Seals and the Odobenidae, the Walrus. These 3 families contain 33 species. The order Sirenia includes Manatees & Dugongs. The Sirenians are collectively also known as “Sea Cows” probably because they graze on sea grasses and other aquatic plants. Sirenians were named for the sirens of Greek mythology, who lured sailors with their song. Sightings of Sirenians in early times, led to myths about Mermaids. Turtles, Alligators, Iguanas, Crocodiles and Snakes are a few of the Reptiles that live in a marine environment. There are over 14,000 species of Marine Fishes, from the tiny Paideios to the Whale Shark. This group of vertebrate animals includes the jawless fishes, cartilaginous fishes (Sharks, Rays and Chimaeras) and the bony fishes. 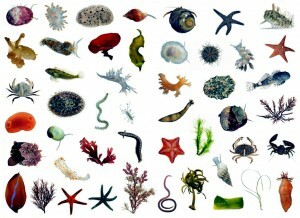 Invertebrates are animals without a notochord or backbone and comprise the largest group of organisms on our planet, with over a million different species. 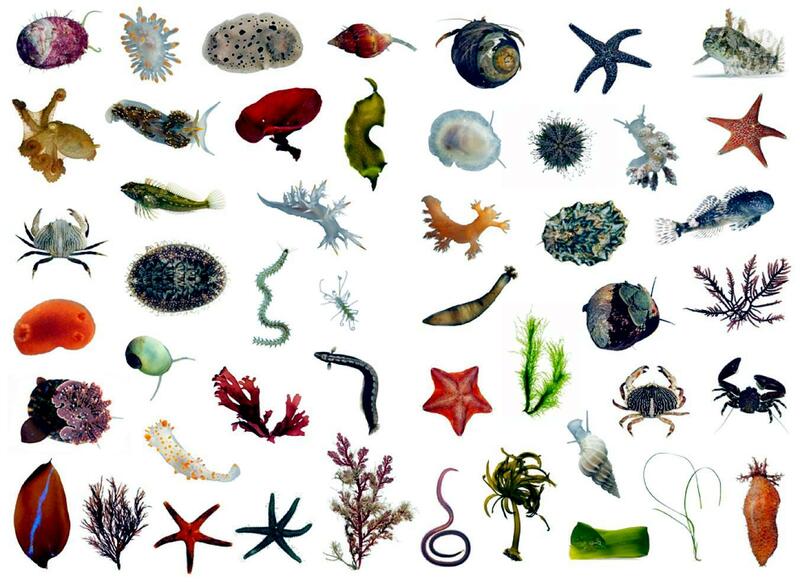 Marine Invertebrates alone comprise thousands of species and are a hugely diverse group of animals from Sponges, Octopuses, Sea Stars (not Starfish), Squids, Sea Anemones, Nautiluses, Lobsters & Crabs, Sea Jellies (not Jellyfish) to Sea Urchins & Sea Cucumbers.